I don't even think this giant coffee I got will do the trick today. We took a 3 or 4 month leave from the YMCA. It wasn't that I didn't love it there (I really did), but we had gotten pretty busy and were paying more to NOT be there than we were to actually be there. Yesterday? Our 1st day back. My shoulder has been bothering me this week so I wanted to take things easy but the boys were chomping at the bit to be right back at the Y. They had been looking forward to this. Ate an early dinner with my husband and when he left to go to work we headed to the Y. For the first time ever I was staying in the activity room with them so they could play and I could just sit. I don't even think we were there a half hour, but I can't be sure. Some bigger kids started running and I saw the Big Guy's eyes light up as he tried to get in on it. He ran towards them. I actually got up to stop him from running and no sooner had I taken like 3 steps and called his name he tripped and literally took flight. Like Superman (the shirt he happened to be wearing). Hit his head right on the corner of one of those square step climber things. I know I ran to him but when I tell you I felt like everything was in slow motion, it was nuts. I picked him up as he screamed and then... the blood. I thought I had seen blood before, but nothing (not even the tongue) bleeds like a head wound - down his head, eye, chest - me - everywhere. I knew I had to get pressure on it and get the twins and go but I couldn't think completely straight to put all those things together in the right order. I thank GOD for this mom near me who rushed over to help and told me what to do as she handed me a white onesie from her diaper bag and told me to hold it to his head. Do you know I actually looked at her and said 'Oh no, I can't use this'? We put it on his head and she helped to clean us up with the antibacterial wipes we both had. The staff was so nice. They helped get the twins together. I was mortified when they told me they had called the ambulance, I didn't want the fuss - or to wait. They helped me get the boys in the truck and just then the ambulance arrived - firetruck too. The twins were excited, chatting up the firefighters. The Big Guy was a mess. 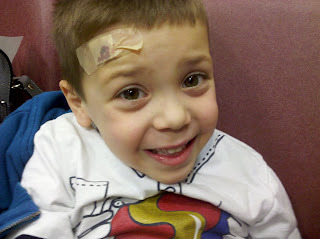 They put a band aide on his head, I signed a form and off we went to Hasbro. In retrospect I should have just driven down the street to Kent County, but all I could think was I should go to Hasbro. We got there sometime between 5:30, quarter to 6 maybe? 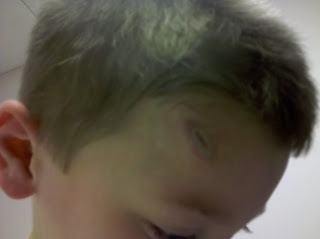 There I am with a bleeding 5 year old with a head wound and two smaller children and by 8pm we STILL had not been seen. My parents came and picked up the twins and I was so grateful once they left. They had been so good but it really took the added weight off once I knew it was just the Big Guy and me. Sometimes after 8:30pm we were told we were going downstairs. I didn't like the sound of that, I didn't even know there was a downstairs. Apparently it's where they try to fast track the easier cases when it's crazy busy in the ER. They hadn't been sure they could take the Big Guy because of stitches and all. Once we got down there I was so relieved to have dr's and nurses taking a look at him. Lots of tears, cleaning the wound and an orange ice pop (that I swear had some kind of medicine to calm him down in it - he got all loopy and giggly), they made a decision to dermabond it. I pushed for stitches at first. I didn't understand what the dermabond was and I was afraid it would split back open. They explained how strong it was, it wouldn't split open and shouldn't leave a scar (where the stitches would) and I was sold. How I held it together I don't know, my heart was breaking to see him in such pain. My husband got there from work as they were dermabonding. They brought him to a room with a teenager in it and he said 'Yeah that's not my son'... upon hearing the screaming coming from the Big Guy he said 'THAT would be my son'... and they followed the noise. I was so relieved once he got there and kind of took over. My cell phone battery had died so he took out his so the Big Guy could get distracted and play Angry Birds (yes even the boys are addicted to that game). The stress was exhausting. We didn't get out of there till nearly 10pm and still had to pick up the twins. Got the boys, got everyone home by 10:30 and into bed. Which is crazy when their bedtime is 7/7:30 usually. Did not expect to take the Big Guy to school this morning, but he is such a trooper. He really pushed to go, wanted to be there. Did not want to miss pre-K today. So against my better judgement I took him in, feeling like it was a good sign. I've waited all morning for that call to come get him but it has not come. Which thankfully means he's doing fine. I still don't know how he didn't get a concussion. I opened up that bloody onesie last night to see it said something like my auntie loves me... I felt terrible we ruined it. I am so thankful for that mom's kindness and help, as well as the staff at the Y. They really helped keep me sane. 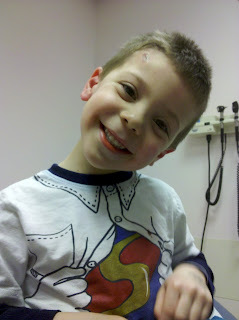 omg kids gotta love them he was a trooper and so was mom never go to Kent!!!! I love the Y the boys go to too they are grreat there!!! You must have been worried.